Hunger is one of those sensations or concepts that stir up a lot of thoughts and emotions in people depending on their relationship to food and body. But experiencing hunger is totally normal and is something that doesn’t need to be feared or ignored. However, it can be tricky responding to hunger if it is something you have been tuning out for a long time. So the Decoding Hunger training has been designed with this in mind and aims to help you develop the skills to decode the type of hunger you are experiencing so you can do your best to respond and honour that hunger appropriately. 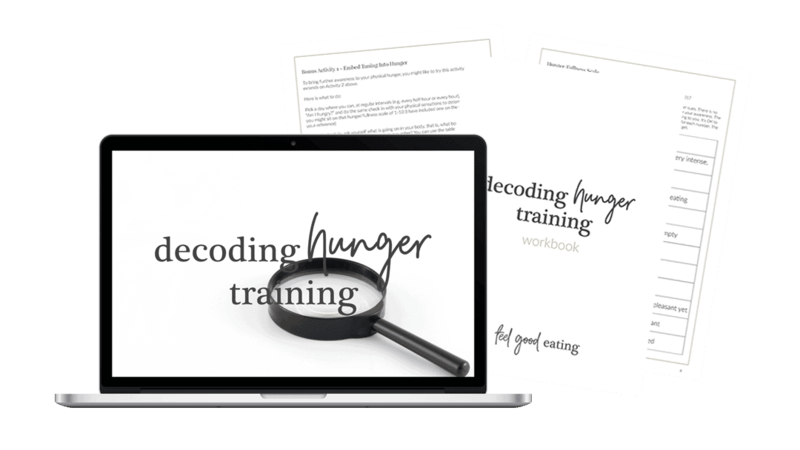 When you sign up for the Decoding Hunger training, you will receive instant access to the training recording along with a workbook full of journal prompts, activities and exercises to complete as you watch the training. When you sign up for the training, you will receive instant access to the training recording along with a workbook full of journal prompts, activities and exercises to complete as you watch the training. This training has been designed for anyone who is looking to reconnect and understand their hunger signals and the different types of hunger they experience over a day. If you have an active eating disorder, the training is not going to be appropriate at this point in time. The training recording runs for approximately 30 minutes, however, this does not account for time spent working through the activities. This will ultimately be up to you. You will have unlimited access for the lifetime of the training, including any future updates, so it doesn’t matter if you can’t watch it straight away. Just log in to access it when you are ready. This program provides general information about nutrition, health and wellbeing that is likely to be applicable to most healthy individuals. It is not designed to provide individualised advice for the treatment of specific health conditions. By engaging in this program, you agree to the terms and conditions of use of this site.